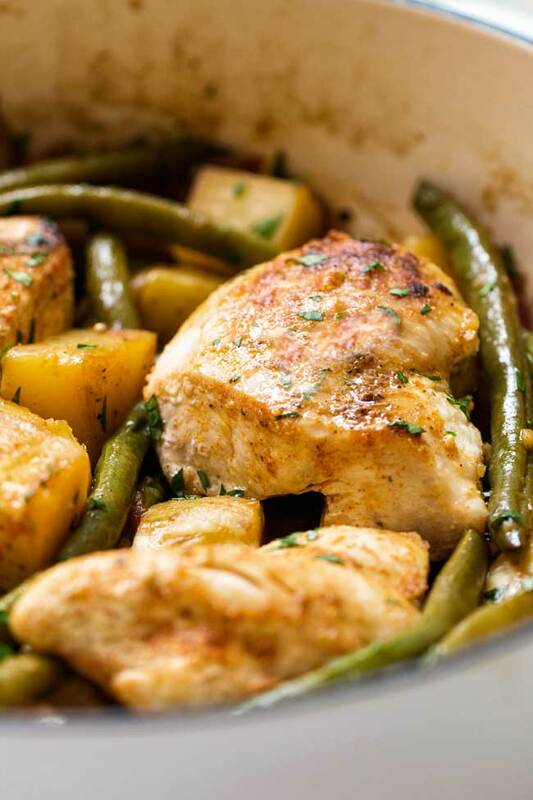 Light and packed with veggies this chicken with lemon-garlic green beans and potatoes is an easy one-pan recipe. Most times, when I sit down to dream up a recipe to share here, I try and figure out a way to share something that won’t leave people with disaster in their kitchen. 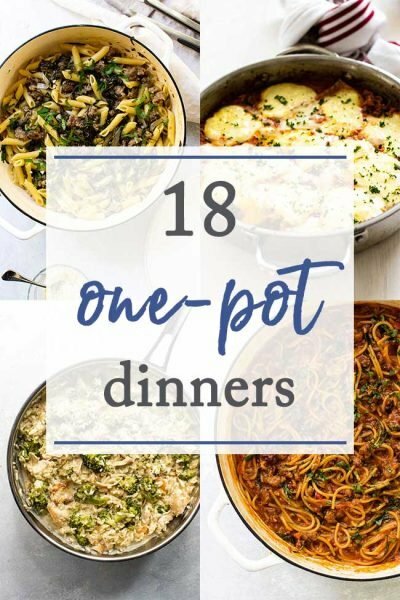 If dinner can be made in one pot, pan, or baking sheet I assume it will be well received because I also assume that folks don’t want to spend more time cleaning up the kitchen than it took to actually make dinner. This goal isn’t always met because sometimes, in order to get the best results, an extra pot or bowl is necessary, but I (again!) assume that if someone chooses to follow a food blog maybe, just maybe, they are okay with a little bit of clean-up. And you might think with that intro I’m about to unveil a complicated, hours-in-the-kitchen recipe. But I’m not! (I can hear the collective phew! as I type this). This week the planning all came together because, today, we have a low-fuss, one-pan recipe. 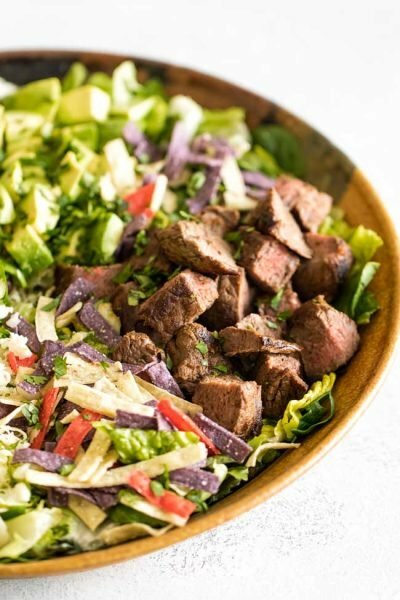 A fast prepper might turn it out in about 30-minutes, but someone who takes their time (aka someone who relishes the sound of the knife on the cutting board <– might be me) will most likely get dinner on the table in 40 minutes. A large pan and a few other basic tools are all you need so if the dishwasher is empty before you get started, clean-up takes all of five minutes, or ten if you give the counters and stove a quick wipe-down. 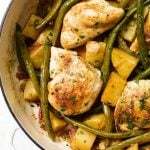 This recipe also falls on the healthy side: boneless skinless chicken breasts with potatoes cooked in a simple lemon-garlic sauce with green beans clocks in around 300 calories per serving. It’s a caloric feat of which I am quite proud of because I am a pasta, cheese, and cream loving girl (case in point: gruyere spaghetti). There’s a satisfaction in knowing I can turn out a dinner that is not only healthy-ish but also delicious and (and!) it all comes together, as I mentioned, in just one large pan. Have you noticed how big boneless skinless chicken breasts are these days? I bought a package of two that weighed one pound, so I sliced them in half. They say a serving of meat is about the size of a deck of cards, so for this recipe, each serving includes a piece of chicken that’s about a quarter of a pound. The chicken is coated with some paprika, garlic powder, and salt/pepper and is the first thing to hit the hot pan. Browning the chicken helps develop a nice fond, also known as the browned bits on the bottom of the pan. When the chicken stock/lemon juice hit the hot pan all of those browned bits infuse the liquid with tons of flavor. This recipe is all about layers that start with the chicken. Next, red onion and garlic are added along with the chicken stock and lemon juice followed by the potatoes. I used Yukon gold potatoes because they hold their shape well. They simmer in the stock for about twenty minutes and emerge looking just like they did when they went in. Except, at the end, they are flavored with the delicious lemon garlic sauce that reduces and thickens as everything cooks. One challenge with one-pan meals is ensuring everything cooks evenly. In this case, the fresh green beans didn’t need as much time as the potatoes, so instead of submerging them in the liquid, I scattered them over the top of the potatoes. This way, they sort of steam and, in the end, they maintain a bit of their crispness. No soggy, sad green beans. The chicken finishes cooking in the same way, although it’s a good idea to check on them and, if they reach 165 degrees before the potatoes are done, remove them from the pan to prevent them from over-cooking. You can always pop them back in for a minute or two at the end to warm them up. 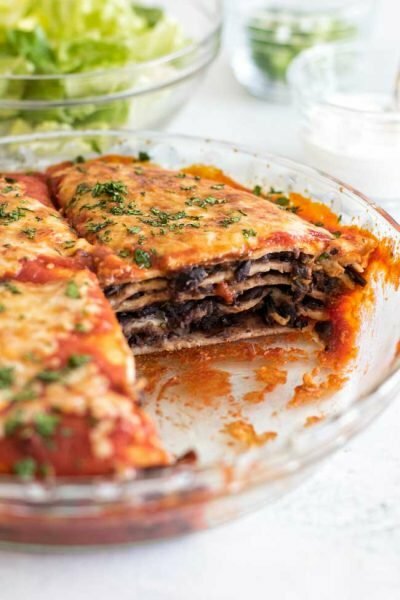 I think of this as a “save room for dessert” dinner because stretched to serve four it’s pretty light, which means a scoop of ice cream after is totally in order. Or, add some crusty bread on the side to soak up the sauce. Or, it serves two very hungry people with some leftovers for lunch the next day. Personally, I went the ice cream route. Chocolate, in case you were wondering. 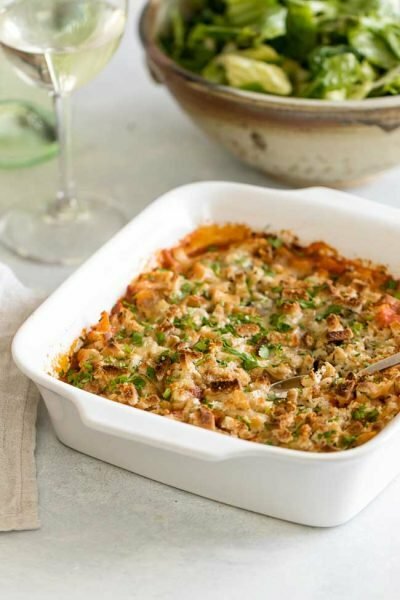 I’ve started this new thing where I search out recipes from my favorite bloggers, plus a few of my own, and compile them into a “recipe round-up”, which is basically a big list of photos with links centered on a single theme. 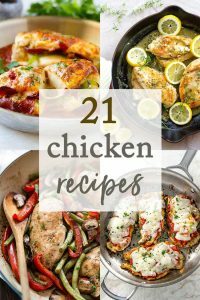 I’ve done a few (check out the recipe round-up category on the menu bar) and recently I compiled 21 boneless skinless chicken breast recipes. So many good ideas! It’s easy to get stuck in chicken ruts, so take a browse and find some inspiration. There’s a little bit of everything including chicken parm, pizza stuffed chicken, more one-pan chicken recipes, and twists on classics like chicken marsala. 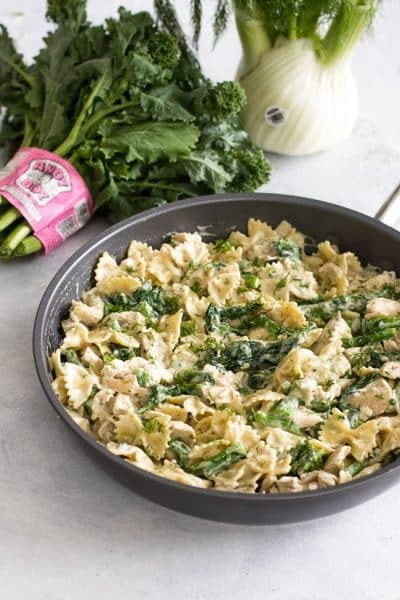 You only need one large pan for this recipe – everything cooks together and when it’s done you have tender chicken with veggies and a flavorful sauce. The recipe is a light dinner for 4, so add some bread on the side to soak up the lemon garlic sauce. Prep & Brown the Chicken: Combine the spices in a small bowl. Sprinkle the spice mix over the chicken, coating both sides. Heat the olive oil in a large pan over medium heat. Add the chicken and brown it on both sides, about 5-7 minutes total. Once browned, transfer the chicken to a plate. Cook the Veggies: Add the onion, garlic, and salt to the pan. Add half of the lemon juice and chicken stock to the pan and, using a spatula, scrape up all the browned bits on the bottom of the pan. Add the potatoes and the rest of the chicken stock/lemon juice and the thyme. Bring it to a boil and then reduce the heat to maintain a simmer. Place the green beans on top of the potatoes (don’t stir them into the liquid). 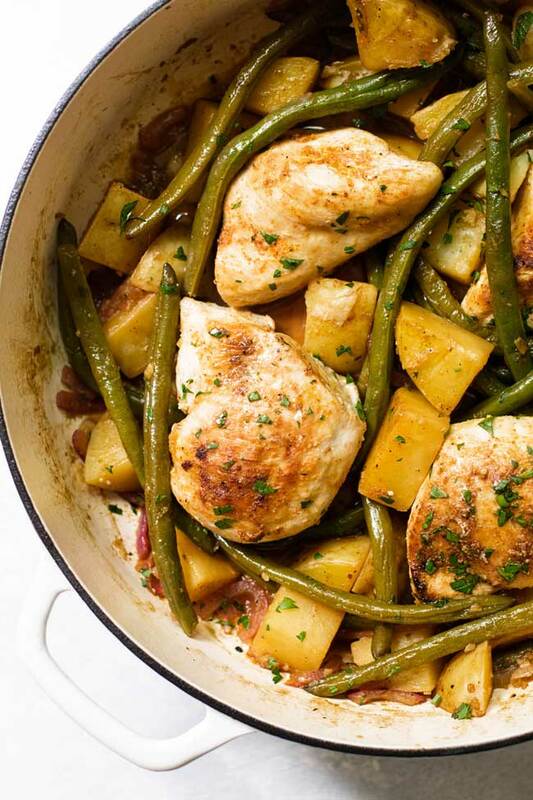 Bring It All Together: Place the chicken on top of the green beans and place a lid on the pan. Let it all simmer for about twenty minutes, or until the potatoes are fork tender and the chicken is cooked through. The chicken is done when its internal temperature reaches 165 degrees, so be sure to check it periodically towards the end and remove if some of the pieces are done early. You can add them in at the end for a few minutes to warm them through, if necessary. I used two (1/2 pound) chicken breasts and cut in each in half to serve four. 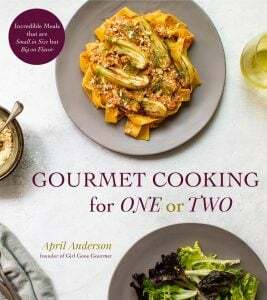 Made for this for friends and it was so easy and flavorful!